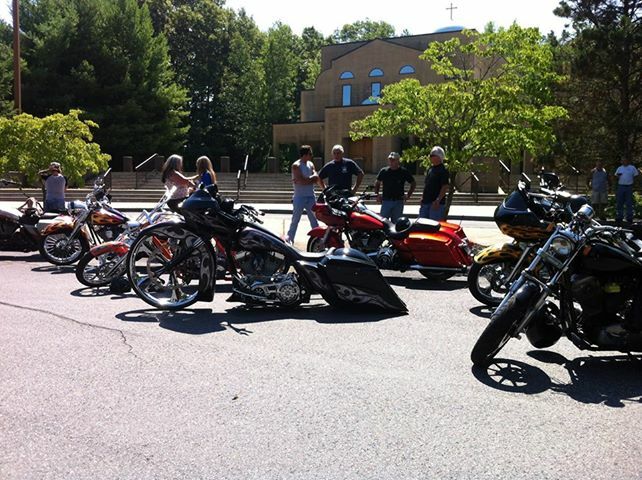 Dave Perewitz brought a couple of very cool machines to the ride! So every now and then we get a chance to just do something fun that benefits a worthy cause. So when our friend Sandy DiBacco organized The Ride For Boston, Productive Media President Geoff Briggs had to dust off his 1996 Kawasaki Vulcan 800 and hit the road! The Ride was about fifty miles of back roads, led by two Massachusetts State Troopers who were on their way to watch over the Taylor Swift concert after our ride. A large group of bicyclists wanted to be included, so we let them go first! All in all, the ride raised over $4000 for Boston's One Fund, which provides money for those affected by the events of April 15 at the Boston Marathon. Next time - sunscreen! Geoff Briggs's red and pearl Vulcan amidst the Harleys.